Eventually, the babies parents will come and collect their child and either praise or scold you depending on how well you have done. Although it seems to be less based on how well you actually did and more on some sort of unfathomable random criteria. Several times when we deliberately made a hash of things, the parent was delighted, then other times when we looked after baby perfectly and had her giggling and cooing the parent told us we were irresponsible and that the child was a mess. Rather than call social services, however, the parents usually arrange to have you babysit their offspring again the next day. Once all the babies have gone home for the day, you can tidy up the house by playing a dish washing or vacuuming mini-game. These are as exciting as they sound. You can also order new toys clothes and even paint and wallpaper, by clicking on a PC situated on the top floor of the house. Again, the terrible touch screen precision rears its ugly head as you try and navigate the menus on the computer. Items are laid out poorly often requiring dozens of clicks before you reach the item you want to buy. Rather than having the items appear for you to use instantly, you have to wait for the postman to deliver them to you. Sometimes you also get toys send to you by Granny or given to you by the parents. Play Imagine Babyz for long enough and you can unlock the back garden, after playing a simple lawn mowing mini-game. Here the game goes from bad to terrible. The block matching game you get to play outside is so poorly implemented it beggars belief. You must click on shapes to fit them into the correct holes as they lurch across the touch screen, tap an incorrect shape and everything resets. The trouble is, the game is so terrible at reading the touch screen that this game is practically unplayable as it constantly thinks you are clicking in the wrong place. Even worse is the bubble blowing game, which takes the act of blowing bubbles, something almost everyone enjoyed doing as a kid, and reduces it to some kind of awful mini game that could only have been dreamed of in some sort of fever induced nightmare. 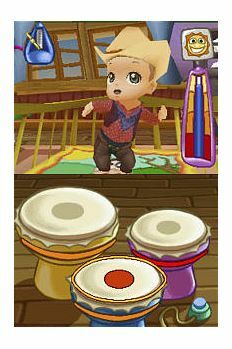 Yes, imagine Babies / Imagine Babyz does have plenty of cute babies, but that really is the only cute thing about this game. The poor quality of the touch screen controls and the terrible mini-games ruin what could have been a really fun game for younger players. More patient little girls who adore babies may get some enjoyment from this title, but would be far better off spending their pocket money on a new doll. If you see Imagine Babies / Imagine Babyz in the store, then we recommend you give it a wide birth!